In 2008, the U.S. Army Corps of Engineers (USACE) began implementing management actions for Caspian terns (Hydroprogne caspia) that were described in the January 2005 Final Environmental Impact Statement (FEIS) and November 2006 Records of Decision (RODs) for Caspian Tern Management to Reduce Predation of Juvenile Salmonids in the Columbia River Estuary (USFWS 2005, 2006). This management plan, which was developed jointly by the USACE, the U.S. Fish and Wildlife Service, and NOAA Fisheries, seeks to redistribute a portion of the Caspian tern colony on East Sand Island in the Columbia River estuary to alternative colony sites in interior Oregon and the San Francisco Bay area by 2015. The goal of the plan is to reduce Caspian tern predation on out-migrating juvenile salmonids (Oncorhynchus spp.) in the Columbia River estuary, and thereby enhance recovery of salmonid stocks from throughout the Columbia River basin. Thirteen of 20 evolutionarily significant units (ESUs) of Columbia Basin salmonids are currently listed as either threatened or endangered under the U.S. Endangered Species Act (ESA). 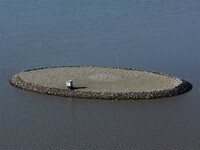 As part of this management plan the USACE completed construction of two 1-acre islands specifically designed for tern nesting in interior Oregon prior to the 2008 breeding season: a 1-acre island on Fern Ridge Reservoir near Eugene, Oregon (completed February 2008) and a 1-acre island on Crump Lake in the Warner Valley, northeast of Lakeview, Oregon (completed March 2008). The constructed island in Crump Lake was at the site of a former island that supported colonial-nesting waterbirds, including Caspian terns. Following the construction of the islands and before the arrival of terns from their wintering grounds, Caspian tern decoys and audio playback systems that broadcast tern calls were deployed on both islands to attract terns to nest. Video cameras were used to monitor the island in Fern Ridge Reservoir instead of direct observation by a field crew, and the island was visited periodically throughout the breeding season by project staff. Review of video footage and our site visits revealed that Caspian terns did not attempt to nest on the island in 2008, but visited the island after the breeding season. During the month of August the Fern Ridge tern island was visited by Caspian terns on 23 different days, with as many as nine terns observed on the island at one time. There is a history of Caspian terns attempting to nest on the remnant island at Crump Lake in the Warner Valley, so a field crew monitored the island throughout the nesting season. During May, a Caspian tern breeding colony formed on the Crump Lake island and grew to about 150 breeding pairs. Concurrently, about 500 pairs of California gulls (Larus californicus), about 850 pairs of ring-billed gulls (L. delawarensis), and 10 pairs of double-crested cormorants (Phalacrocorax auritus) initiated nesting on the new island. In early June the Caspian tern colony dropped to a low of 23 nesting pairs due to egg predation by gulls. 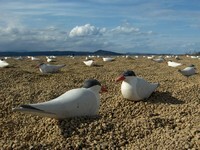 We selectively removed 10 gulls that were depredating tern eggs, once the required depredation permits had been issued. Subsequently, the Caspian tern colony expanded to 428 breeding pairs, and ultimately raised about 145 young terns to fledging age. Hundreds of pairs of nesting California and ring-billed gulls and one pair of cormorants also successfully raised young on the Crump Lake island. The diet composition of Caspian terns nesting on Crump Lake consisted primarily of tui chub (Gala bicolor; 55.4% of the identifiable prey items), followed by bullhead catfish (Ameiurus sp. ; 27.8%) and crappie (Pomoxis sp. ; 15.0%). The remaining 1.8% of prey items consisted of rainbow trout (Oncorhynchus mykiss), lamprey (Entosphenus spp. ), suckers (Catostomus spp. ), bass (Micropterus spp. ), and dace (Rhinichthys spp.). A total of 5 suckers (0.17% of identifiable prey items) were observed by researchers during the nesting season, one of which was positively identified as a Warner sucker (C. warnerensis). Warner suckers are listed as threatened under the ESA. Thirty of the Caspian terns that colonized the newly restored island in Crump Lake had been previously banded. Of these, 18 had been banded at the Crescent Island Caspian tern colony on the mid-Columbia River near Tri-Cities, Washington, about 450 km to the north. Five of the banded terns on Crump Lake island had been banded on East Sand Island in the Columbia River estuary, over 500 km to the northwest. Based on the number of terns banded on East Sand Island relative to the size of that colony, we estimate that perhaps as many as half the Caspian terns that colonized the new Crump Lake island had originated from the East Sand Island colony. These band re-sightings demonstrate that Caspian terns can be recruited to new colony sites from existing breeding colonies over considerable distances. Although no management action was undertaken to enhance Caspian tern nesting habitat in the San Francisco Bay area in 2008, we monitored existing Caspian tern colonies in the Bay area to gain a better understanding of current colony status, diet composition, and factors limiting colony size and nesting success in preparation for potential colony expansion at Brooks Island in the central Bay and island construction/restoration in the south Bay. There were four known breeding colonies of Caspian terns in the San Francisco Bay area in 2008, where a total of approximately 1,000 breeding pairs nested. This represents a decline over the last 3-5 years in both total number of breeding colonies (formerly 5) and total number of breeding pairs (1,085-1,372) in the San Francisco Bay area. As was the case in 2003-2005, most breeding pairs of Caspian terns in the San Francisco Bay area (81%) nested at the Brooks Island colony in 2008, by far the largest tern colony in the Bay area (ca. 810 breeding pairs). Marine forage fishes, in particular anchovies, surfperch, and herring, were the predominant component of Caspian tern diets at Brooks Island in 2008. In 2008, the proportion of the diet that was juvenile salmonids increased to about 9%, raising concerns that relocation of Caspian terns from the Columbia River estuary to Brooks Island might reduce survival of ESA-listed salmonids from the Sacramento River basin. A radio telemetry study of Brooks Island terns, combined with recoveries of coded wire tags from smolts on the Brooks Island colony, revealed that the vast majority of salmonid smolts consumed by Caspian terns from this colony in 2008 were hatchery-reared, non-listed fall-run Chinook that were released from net pens in eastern San Pablo Bay. Caspian terns also nested at Eden Landing, Stevens Creek, and Agua Vista Park, but only periodic colony monitoring was conducted at the tern colonies at Agua Vista Park and Stevens Creek, while weekly colony monitoring was conducted at Eden Landing. The Eden Landing colony was more intensively monitored because of its proximity to Hayward Regional Shoreline and Don Edwards National Wildlife Refuge, two sites identified for future island construction/restoration for Caspian tern nesting in the FEIS and RODs. We estimated that 56 breeding pairs of Caspian terns nested at Eden Landing in 2008. In contrast to the diet of terns nesting on Brooks Island in 2008, terns nesting at Eden Landing had a much smaller percentage of juvenile salmonids in their diet (0.2% at Eden Landing versus 9% at Brooks Island). These and other previously reported results (Roby et al. 2003b, 2004, 2005) suggest that Caspian tern colonies located in the south Bay will likely have little impact on survival of juvenile salmonids compared to Caspian tern colonies in the north and central Bay. Tern nesting success at Eden Landing (0.81 young fledged per breeding pair) was higher than at Brooks Island (0.42 young fledged per breeding pair). All four Caspian tern colonies in the San Francisco Bay area appeared to be primarily limited both in size and productivity by the availability of suitable nesting habitat and/or the quality of nesting substrate. Other factors limiting nesting success for at least some of the colonies were mammalian nest predators, displacement by other colonial waterbirds, and human disturbance. Food availability may be a limiting factor for nesting success in some years, but it did not appear to be a significant constraint on productivity in 2008. 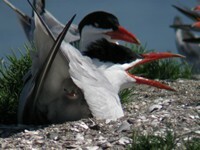 The preliminary conclusions from this study of Caspian terns nesting in interior Oregon and the San Francisco Bay Area during 2008 are (1) Caspian terns can be recruited to new colony sites (i.e., Crump Lake) from existing breeding colonies (i.e., East Sand Island) over considerable distances, (2) Caspian terns are more easily recruited to nest at sites with a prior history of tern nesting (i.e., Crump Lake island), as compared to sites with no history of tern nesting (i.e., Fern Ridge island), (3) the diet of terns nesting at sites identified as alternative nesting locations in the FEIS (i.e., Brooks Island and Crump Lake) consisted mostly of forage fishes that are neither listed under the ESA nor of significant economic value for commercial, recreational, or subsistence fisheries, (4) availability of suitable sites for breeding colonies was the main factor limiting the number and size of tern colonies in both the San Francisco Bay area and interior Oregon, and (5) nesting success at existing colonies was limited by attributes of those colony sites as they influence (a) quality of nesting substrate, (b) vulnerability to mammalian and avian nest predators, (c) displacement by other colonial waterbirds, and (d) human disturbance.